In a previous article, I detailed how research from Russell Investments had proven that the lowest risk stocks, as measured by the beta indicator of volatility, had the highest rewards over time for long-term investors. That goes against the school of thought that the highest rewards in investing come only from taking the highest risks. For investors looking for such a stock, Honda Motor Corp. (NYSE: HMC) has proven itself to be a high-reward, low-risk asset. For the last year of market action, Honda Motor Corp. is up more than 26%. Adding to the total return of Honda is its dividend yield of 4.93%. The average dividend for a member of the Standard & Poor’s 500 Index is around 1.9%. With a payout ratio of just 39%, Honda Motor Corp. has plenty of cash to increase its dividend or initiate a stock buy-back program to reward its shareholders. The shareholders of Honda Motor Corp. have proven to be very loyal. That is shown by its beta of just 0.81. The beta for the stock market as a whole is 1. That means that Honda Motor Corp. is nearly 20% less volatile than the entire stock market. If its shareholders were constantly buying and selling the stock, the beta for Honda would be much higher. 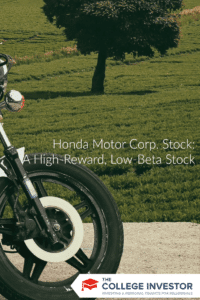 Bullish on Honda Motor Corp. There are many financial indicators that point to an even more bullish future for Honda Motor Corp. The price-to-sales ratio is just 0.69. That means that every dollar of sales is selling at almost a one-third discount in the stock price. The price-to-earnings growth ratio is only 0.77. One of the most important indicators for investing legend Peter Lynch, a fairly priced stock will have a price-to-earnings growth ratio of 1. The future growth of Honda is selling at almost a one-quarter discount, per the stock price. The entire act of investing is buying the future income stream of an asset. As such, Honda is a very undervalued blue chip company. According to the analyst community, earnings will soar in double digits for Honda. Earnings-per-share growth is already strong this year at 73.90%. Next year, it is projected to be 42.07%. Over the next five years, Honda is expected to post earnings-per-share growth of 25.80%. While it has been a strong year for Honda, there are few betting that the stock price will fall. A short float of 5% is considered to be troubling for a company. The short float for Honda is just 0.04%. Moreover, the mean analyst rating for Honda Motor Corp. is a 1, the highest possible. Now trading around $40.50 a share, the mean analyst target price for Honda Motor Corp. over the next year is $45.50. That is about a 10% gain, just in the stock price. Combined with the dividend, Wall Street is looking to Honda to have a total return of around 15% for the next 52 weeks. For a low beta stock, that is a nice double digit return as there appears to be little risk based on its volatility. What are your thoughts on Honda Motor Corp.? Is there a place for it in your dividend portfolio? Low beta is an interesting phenomenon. I read an article a while back (link below) that challenges low beta as an inefficiency, claiming that it’s actual an accurate representation of risk/return. The argument is essentially that both low and high-beta stocks have the same downside, which is to lose everything (even if not the same likelihood), but that high-beta stocks have much higher upside. So high-beta is a sort of implicit leverage, which investors should be willing to pay more for in the form of lower expected returns. Low-beta stocks therefore offer higher expected returns because you take on the risk of losing everything without the reward of the higher upside. The article explains it much better than I can. It’s a pretty interesting read. I was a l oyal Honda customer, but never thought about investing in their stock. In fact, the car I sold last year was a 17 year old Honda Accord and I still own a 97 Honda Prius! It is a classic and holding its value.